Aquaman goes from the comic pages of yore into the CGI universe of now with actor Jason Momoa bringing the DC comic character to life. 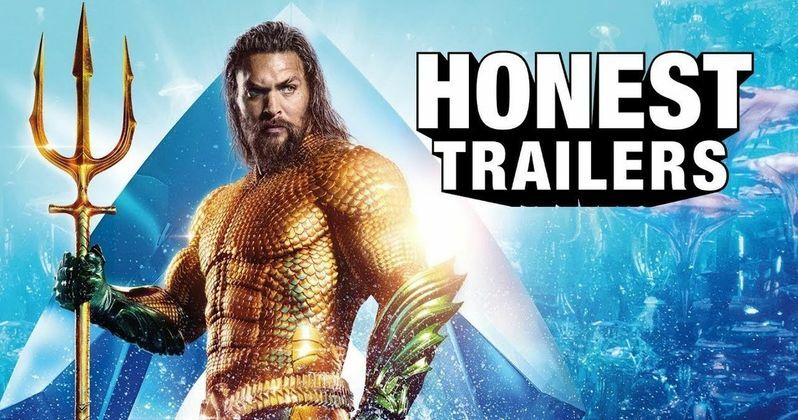 The Honest Trailer certainly has some key Momoa moments in it as well as poking fun at a host of other scenes from the film. The Honest Trailer is over five minutes long, so there is plenty of time to bask in the visual feast of the overall production of Aquaman. The youtube piece starts off with some massive scenes that seem to shake the narrator to the point of him asking, "What is happening?" The video cuts to a scene from an original old school cartoon, where Aquaman says "My ability to talk to fish is of no use Wonder Woman." Wonder Woman is not impressed. Then they bring in the movie hero Jason Momoa in the lastest and biggest ever portrayal of the comic book Icon. This trailer points out during the clip that Aquaman's powers seem to not really be super consistent in their on screen modern presentation, but that is secondary to the actual character portrayed so well by Jason Momoa. The guys comment on how amazed they are that the filmmakers were actually able to make that ruddy orange and green original to the comic suit look so damn "cool". They cut from shot to shot commenting on the story of how the Aquaman movie centers around Arthur Curry becoming King Arthur. An age old legend transferred to the underwater realm where the narrator points out there are so many locations covered in the film that it can get kind of confusing. The editors of the youtube video cut up the film to show just the locations, then they lay them out on the screen so you can get a look at just how many different locations are used constantly being used. It's a lot. The focus then shifts to a rapid fire presentation of the epic occurrences in the film one after another in a way that ends up being very entertaining with the Honest Trailers John Bailey voice getting more and more intense as the huge action sequences are flashing on screen. The guys at Honest Trailers mention 'jumping the shark' while showing all the awesome sharks everyone is riding around on. The video then points out that the latest DC adventure shows all of Aquaman's storylines in one big movie extravaganza, all at once. That can be quite confusing, as they give a nod to the future mighty task afforded director James Wan to make Aquaman 2 bigger, better, and more complex than the epicness that is the first go around with the Fish Boy. Wan will be back for sure in the making of Aquaman 2, and so will co-writer of Aquaman, David Leslie Johnson-McGoldrick. The film will also feature the return of Black Manta. As Black Manta is the mortal foe of Aquaman, I am sure the next movie will have a lot of the super villain battling in it. Thanks, Honest Trailers.